Bloggers were consumed with the upheaval in Egypt last week, using the platform to relay news updates, provide context to the crisis and debate the implications of the situation. Indeed, the Egyptian crisis last week became the third-largest international story tracked by PEJ since it began the NMI in January 2009. The only overseas topics to surpass it were the UK elections in May 2010 and the protests following the disputed Iranian elections in June 2009. Bloggers’ interest in the story mirrored that of the mainstream media last week, where it accounted for 56% of the newshole, according to the News Coverage Index. A number of bloggers stepped into the role of news provider as much if not more than news commentator. They relayed up-to-the-minute reporting about the protests, through links to mainstream news outlets or nuggets of information gleaned from a variety of social media. For many who used the blogosphere as a space to discuss the ramifications of events in Egypt, two major questions emerged. Was the potential revolution in Egypt a positive or negative development? And should President Bush or President Obama get the credit or blame for the developments in the region? Some of the blogs that served as aggregators of breaking news directed readers to traditional news sources that offered instant updates. One often linked-to site was the BBC, which delivered new reports every few minutes throughout the day. At times, bloggers would post the link while offering a brief summation or opinion. "Yesterday brought scattered reports that the army may be wavering in support of Mubarak," wrote Lawrence Person at BattleSwarm Blog on January 29. "Today? Not so much. There are sporadic reports of gunfire, and lots of reports that citizens groups are banding together to prevent looting." "I want to be optimistic [about the outcome], but it’s difficult," admitted Tamerlane. Some bloggers even worked to mirror in a way the kind of minute-by-minute updates offered by the BBC and other mainstream press online. These blogs don’t have reporters in the field and have many fewer readers than most large news sites, but still served as information providers for those that they reached. "For background and informative overviews of events, I recommend reading http://promotingpeace.tumblr.com/post/2969260999 as well as the Wikipedia article on the 2011 Egyptian protests," suggested mekosuchinae before providing a list of suggested Twitter feeds and hash tags to follow. "Thank you thank you thank you for all the links," responded a commenter named tifaria. "The US media is…well, it is what it is, and the coverage has been frustrating to say the least." Morgan deBoer, on the blog Matador Change, linked to traditional news stories and blogs, and pieced together a timeline related to the looting of Egyptian antiquities. "At the time of this posting, sources on Twitter, Aljazeera, Reuters, and Fox News are reporting increased tension in the streets of Cairo and Molotov Cocktails, fire, and gunfire in and around the Egyptian Museum," deBoer wrote. "The army is extinguishing the flames and news of damages has not yet been reported." For those who chose to use blogs to voice their opinions about the protests, a major question was whether the unrest was a good thing for U.S. interests and for the people of the region. The verdict was not clear cut. "If the events of this January tell us anything it is this: the universal desire for democratic freedoms can be subdued for many years, but never for good. All tyrants eventually fall," predicted Ibn Ibn Battuta. "What gives me hope is that there are young people… who care, who are not afraid, who will be part of movements and notions greater than themselves, and who will proudly, boldly and humbly re-tell the story," described Roxanne Krystalli at Stories of Conflict and Love. They worried that the outcome would result in a government even more repressive and perhaps more hostile to the U.S. Many pointed to a January 31 Los Angeles Times article indicating that the Egyptian military was preparing to crack down on the protestors. "There is a danger that the protests could lead to less, not greater, liberty in Egypt," warned Conn Carroll at the Foundry, a blog run by The Heritage Foundation. "While many of the groups organizing the protests…do use pro-democracy rhetoric, there are powerful forces in the country that harbor Islamist goals that are incompatible with genuine democracy, including the anti-Western Muslim Brotherhood." Debate over the events, though, took on more of a political tinge when the subject turned to George W. Bush’s foreign policy and Barack Obama’s handling of the crisis. Some of that argument was spurred by an opinion piece in the Washington Post connecting the protests to George W. Bush’s "freedom agenda." Former presidential adviser Elliott Abrams argued in the piece that the protests vindicated Bush’s strong encouragement of the spread of democracy in the Middle East and that President Obama’s response does not carry this through. Again, bloggers were split. Some agreed with Abrams. "The Bush legacy continues to grow," posted Prairie Pundit. "Let us pray that others in positions to affect policy do the same [as Abrams suggests] and follow through with actions to secure peace and liberty in the Middle East and throughout the world," declared Old Tybee Ranger. Others viewed Abrams’ piece as revisionist history. Most of the evaluations of Obama were tied to the news that he would support a role for the Muslim Brotherhood, a banned Islamist organization, in a new Egyptian government as long as the group rejected violence and supported democratic goals. "Considering that the Obama administration has admitted that they support a role for the Muslim Brotherhood in Egypt’s government, one is left with the only logical conclusion that can be drawn from such nonsense: Obama must really, really hate Israel to even harbor such a thought," decided Doctor Bulldog & Ronin. "Obama uniformly sides with our enemies but rarely, if ever, with our friends and allies," agreed James Simpson at Free Republic. "His administration is packed with far-left radicals and vicious anti-Semites. And therein lies the rub, because what we are witnessing in reality is this president’s un-American, anti-American, treasonous ideology in full play." Criticism of Obama’s actions clearly outweighed support in the blogosphere. This seemed to deviate somewhat from general public opinion. According to a recent Gallop poll, 47% of the public approved of how Obama was dealing with the situation in Egypt compared to 32% which disapproved. The proliferation of eyewitness images of large demonstrations and sporadic violence in the streets of Cairo brought Egypt to the forefront on YouTube as well. Two of the most watched news videos on YouTube last week were dramatic clips of the protests. One video from Russia Today was footage of a violent confrontation between Egyptian police and protestors on January 28. Shot from right alongside the protestors, viewers can see and hear the chaos. The second clip, which was attributed to CBS News but was posted by an unnamed individual, featured protests on the same day, but from high above the ground. In this video, the protestors march to confront the police while chanting, but the more distant view shows no clear acts of violence. The person who posted the video, freedommessenger20, claims the clip shows security forces retreating. The other major subjects on blogs last week were a mix of journalism, an international conflict, and a unique meteorological tradition. 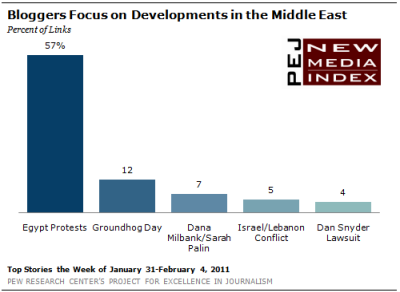 Groundhog Day, February 2, was the second-biggest subject, at 12% of the links. Many bloggers focused on an Associated Press video of the world’s most famous groundhog, Punxsutawney Phil. According to Phil’s handlers, the groundhog did not see target=”_blank” his shadow when he emerged from the ground, a good omen that spring will arrive early this year. At No. 4, with 5%, was a BBC report about a drone flown by the militant Lebanese group Hezbollah over Israel in response to what it says was a violation of Lebanese airspace by an Israeli aircraft. On the social networking site Twitter, where the news agenda is often technology heavy, there was a more diverse mix last week with two top stories about health care and one about the death of a well-known composer. The top story (at 23%) was an unusual tale of intrigue featuring the hacking of the online dating site, Plentyoffish. According to the site’s CEO, Markus Frind, an Argentinian hacker attacked the site under his real name and tried to extort him. In response, Frind threatened to sue the hacker and even emailed the hacker’s mother. The passing of composer John Barry, best known for his work on movie scores including several of the James Bond films, was No. 2, at 16%. Stories about Facebook constituted the third largest subject (at 11%) including a Wired story about two media artists who imported 250,000 publicly available Facebook profiles to a dating site to demonstrate potential dangers of social media and identity theft. 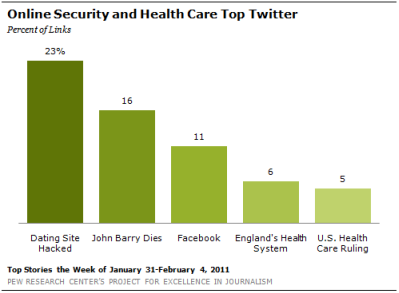 Two stories about health care rounded out the top five topics last week. A BBC story about controversial plans to overhaul England’s National Health Service was No. 4, at 6%. And news that a federal judge in Florida ruled that the new health care reform law was unconstitutional finished fifth, at 5%.